As we are reaching the mid point of Lent, I wanted to once again share with some of the information presented by the women of our church at our retreat last fall. The topic of this talk was Preparing for Pascha, and was mostly a collection of resources and ideas to help prepare for this time of year. 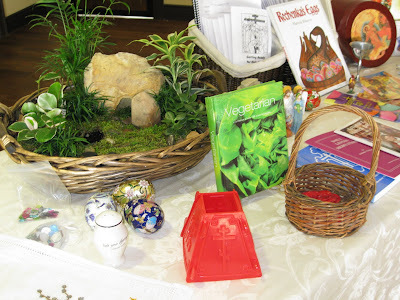 There are so many resources out there, so I have included a few photos from the display table, along with a lengthy list of links for many of the items you see in the photos. The main focus of this talk was about thinking ahead, simplifying this time of year by doing things ahead, and being purposeful in planning our lives around the services of the church, rather than fitting church into our lives when it is most convenient. It is also a time to reduce our distractions and focus on preparing through our daily life. We can turn off the television, avoid movies and other forms of entertainment, and instead spend our time in services and spiritual reading. Children can be encouraged to add to their reading, selecting a book such as I-vile to You-ville, or perhaps a volume of the lives of the saints. For an explanation of the red oval box with the resurrection icon on it - stay tuned. That is our Holy Week box for children, which I will share in detail in a few days. For now, here are a set of links that some may find useful. 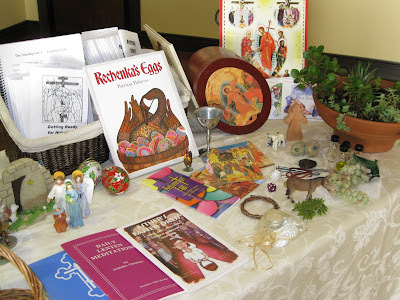 There was a completely separate talk on the Pascha basket I will share in a few day with some helpful links.